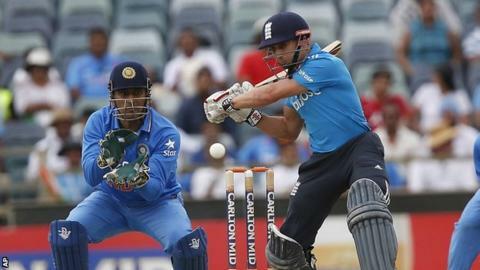 England reached the final of the one-day tri-series courtesy of a three-wicket victory over India in Perth. India batted first and collapsed from 83-0 to 200 all out, with Steven Finn taking 3-36 and Ajinkya Rahane top-scoring with a patient 73. England were in deep trouble at 66-5 but were rescued by a sixth-wicket partnership of 125 between James Taylor (82) and Jos Buttler (67). England will play Australia in the final at the same venue on Sunday. Eoin Morgan's side have lost both of their games against the hosts in the tournament. The final will be England's last one-day international before the World Cup starts on 14 February, although they also have warm-ups against West Indies and Pakistan. Reigning world champions India, who failed to register a win in the tri-series, have warm-up games against Australia and Afghanistan. Having lost the toss at the Waca and been asked to bat, India openers Rahane and Shikhar Dhawan overcame a nervous start on an uneven pitch to put on 83 for the first wicket. But the dismissal of Dhawan, who was caught behind by Buttler off the bowling of Chris Woakes, triggered the collapse. Virat Kohli and Suresh Raina both perished cheaply trying to take on the off-spin of Moeen Ali. Rahane lost another partner when Ambati Rayudu edged behind, handing Stuart Broad his first wicket of the series. The powerplay saw India lose further ground, with only 23 runs scored for the loss of Rahane and Stuart Binny. Finn accounted for both, dismissing Rahane caught behind and Binny courtesy of an outstanding slip catch by Ian Bell. When captain MS Dhoni fell - undone by a ball that kept low from James Anderson, five balls after being hit on the helmet by the seamer - India looked unlikely to make it to 200. However, some lusty hitting from Mohammed Shami saw 35 runs added for the last wicket. Woakes eventually ended the innings with 11 balls remaining, but not before Shami had made the second-highest score by an India number 11 against England. Finn was the pick of England's bowlers, while Anderson returned miserly figures of 1-24 from nine overs. In reply, Bell was trapped in front by Sharma before Moeen threw his wicket away, chipping Axar Patel to Rayudu at long-off. And when Joe Root fell for a duck in the following over, having driven a return catch to Binny, India were suddenly back in the match. Morgan was undone as much by the unpredictability of the pitch as the medium pace of Binny, squirting a catch to mid-on. In contrast, Ravi Bopara had no such excuses, steering a long-hop from Binny straight into the hands of Ravindra Jadeja at point. Rahane should have run Buttler out when the Lancashire man had only three runs to his name and the missed chance proved to be the crucial turning point. Taylor and Buttler slowly rebuilt the England innings, the former making his fourth fifty in eight matches since being recalled to the one-day team. With Taylor playing the anchor role, Buttler was able to play some shots and his sixth fifty in ODIs came from 58 balls and included a couple of sweetly-timed off-drives. England had a late wobble - Taylor top-edging a pull shot to long-leg and Buttler holing out in the covers - but Woakes and Broad saw them home with 19 balls to spare. Can India win the cricket World Cup again? Read more on Can India win the cricket World Cup again?